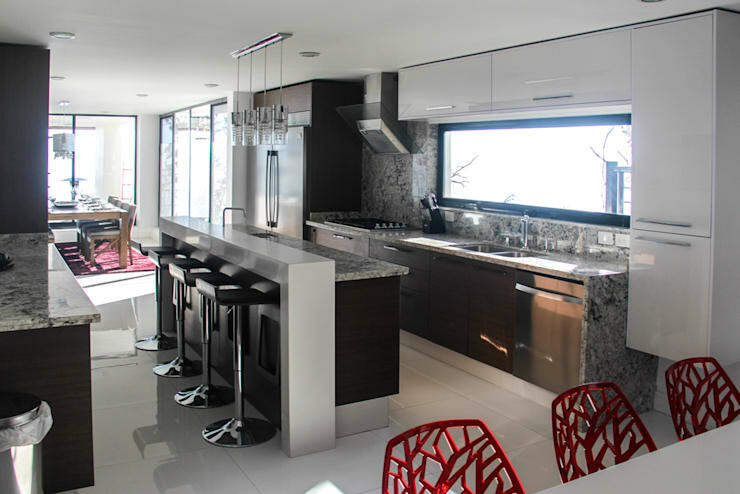 Today on homify 360 we head to the mountains… no, not for a hike. Our virtual tour takes us to a stunning and luxury villa located on the mountain, in the middle of a forest. A home that is the perfect escape from the bustling city awaits us, surrounded by serenity and tranquillity. Although the home is set in nature, it is anything but country style. 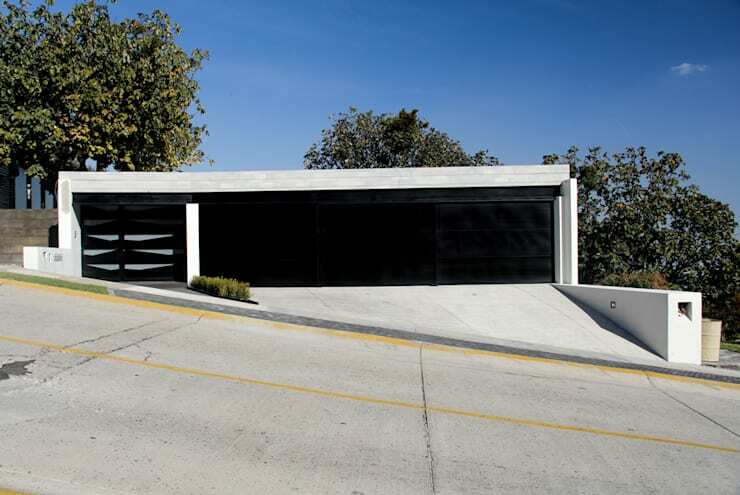 Instead this home has all the beauty and elegance of modernity and simplicity, both inside and out, and was created by the expert team at AAEstudio in Mexico. The architectural team had a plan in mind that took the environment into consideration while maintaining a luxurious and comfortable atmosphere. We cannot wait to see those city views from lofty heights! 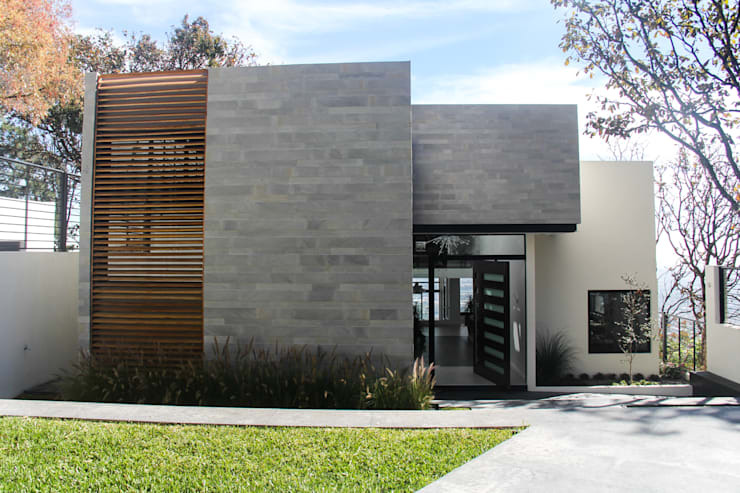 This home is striking and attractive from the main façade to the perfect interior. The materials and colours used in this architectural marvel include stone, wood and steel in neutral tones, that blend in well with the natural environment of towering pine trees and greenery. The wide entrance to the home and the front door is large and inviting and in its wood and glass design it contrasts the stone and lighter toned wooden wall exterior, making this part of the home warm and welcoming. Next up, a view of the pool side and patio! This rear façade of the home is grand and luxurious with panoramic views from any point, while maintaining a sense of privacy and intimacy required in a family home. A home such as this will not be complete without a large swimming pool for those incredibly hot summer days, while the deck chairs add another element of relaxation to the comfortable outdoors. This patio area will make the perfect outdoor party spot for those family and friends you've been promising to invite over for a barbecue. No excuses now! It's even more beautiful than by day… and from this angle we can see the incredible view! The natural sunlight in this kitchen adds the perfect amount of warmth and cosiness. This beautiful space has two functional areas: the first houses the appliances, cooking area, sink and cupboards while the other area has a raised bar area and high stools, great for a quick meal. This kitchen in its neutral tones of brown, white and granite countertops has been excellently planned so that the space available could be used wisely. The kitchen is definitely ultra-modern in its design making it attractive and the perfect fit for this home. 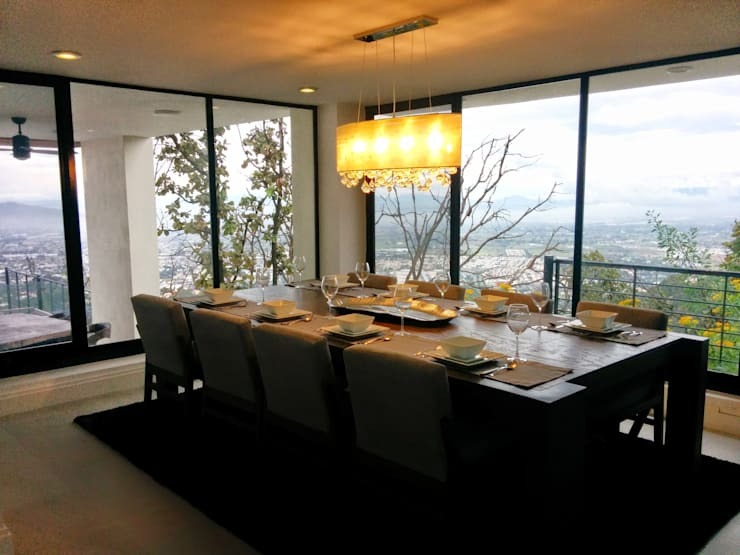 This dining room is absolutely sophisticated, and with its 180 degree views of the city. An intimate dinner with friends and family can begin with sundowners on the balcony. Don't you think the views of the city and the horizon are the perfect conversation starter in this elegant space? The large dark wooden dining room table adds an extra sense of beauty to the room, while the brown chairs have been upholstered comfortably. The suspended lamp further emphasises the intimate décor creating a golden tone romantic atmosphere. A few boxes need to be ticked for a bathroom to be stylish and this image has all bases covered. It's light and bright with modern fixtures, clean lines and simple finishes, not forgetting the fantastic marble finish of the walls. The darker wooden cabinet and double sink creates an elegant and glamourous storage area, adding more luxury to this space. 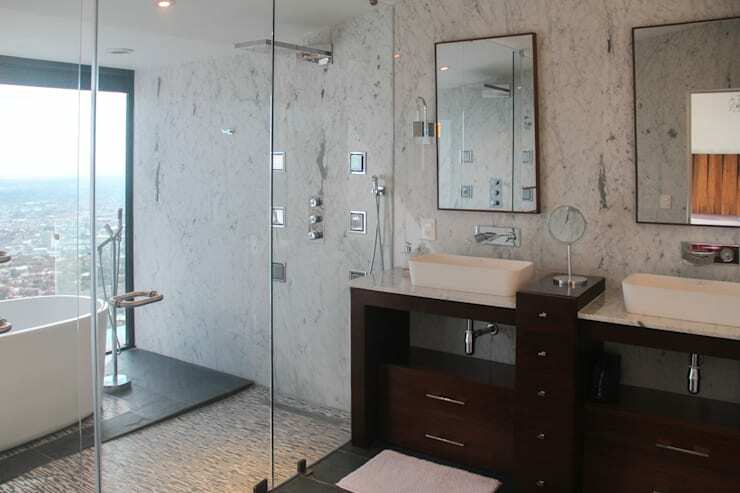 The shower door is made from tempered glass, but gives us a peek into the rather generous space inside. A bathroom with views from the tub, so luxurious and elegant… now who wouldn't enjoy that! 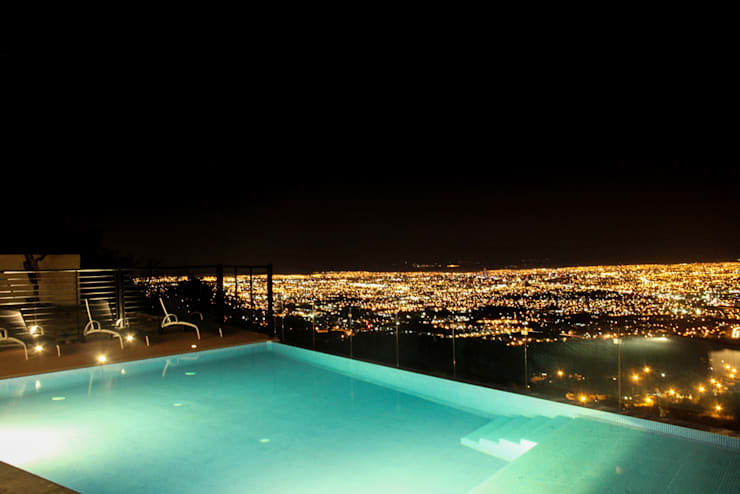 The main attraction of this beautiful home has to be the panoramic views of the city. In this image we see a comfortable black stone table table and seating area, perfect for those sunny days when a barbecue is in order! 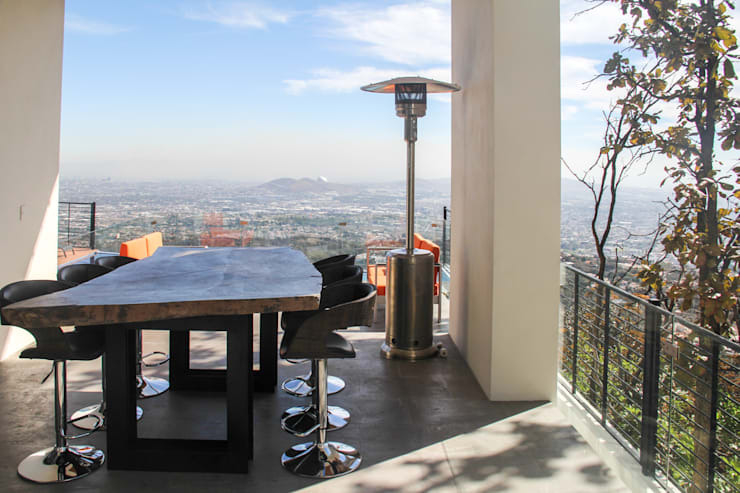 The terrace even has a space heater for chillier days, making the outdoors as comfortable as the indoors in this magnificent home on the mountain. How amazing would this terrace be for a fun afternoon with family and friends? To tour another residence with an unbelievable location, check out: The Incredible Luxury Home on a Cliff. What was your favourite aspect of this home - was it those incredible views? Share your thoughts with us!